Gurston Down Speed Hillclimb is located in glorious downland near Salisbury, Wiltshire, in Southern England. In 1967, BARC South West, the club that runs Gurston Down, staged it’s first speed hill climb here at Gurston Down. 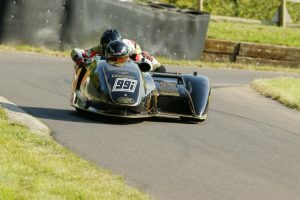 Gurston Down is now a multi award winning speed hill climb venue and one of the fastest in Britain. We have held over 300 meetings at the hill and stage nine events a year including two for the MSA British Hill Climb Championsip. We would not have been able maintain this continuity down the years without the wholehearted support and co-operation of the Gurston Down farm owners, the J Hitchings Partnership, to whom we are deeply indebted. The challenge of Speed Hill Climbing sounds simple. Drive or ride fom a standing start to a flying finish in the shortest possible time. Cars and motorbikes (and sidecars too) are divided into categories and classes, so that similar cars (bikes) compete against each other. Each driver also has their own personal best time so not only do they race against other but themselves. The ultimate achievement for any driver or riders at an event is the “Fastest Time of the Day” or FTD. There are also class and course records too. Timing is done to the nearest one-hundredth of a second, a tiny amount, but one which can decide a class win – or indeed the championship! What is Gurston Down’s Course like? It’s fast! The course record produced an average speed of just over 85 mph and the fastest recorded speed over the finish is 159 mph. The course starts down-hill, dropping down to Hollow, where the fastest cars around doing around 120+ mph, round a sweeping left hander of Little Hollow and Hollow Bend, braking very hard in to the sharp and steep uphill section of Karousel. Speeds though Karousel are down to 25 mph. After the second right hand part of Karousel there is a short straight with a bump, Deer Leep where cars and bikes can get a little air, before the hard left hand corner of Ashes.. After Ashes, it’s up-hill again to the finish. Spectators have great access to the course. There are plenty of viewing points from the start-line to passed Ashes bend. They also have full access to the paddock arears where cars, drivers, riders and bikes will be happy to chat and show you around their cars or bikes. Entry costs are: Event Days, £10 per adult, under 14s free, parking and paddock entry free. See the Event Calender for full details. Test Day and our two practice days are £6 per adult, under 14s free, parka and paddock entry free. At present we can only accept cash on the gate. For those of you who come regularly, you should consider a Season Pass – these are £55 and offer a substainal saving over the dialy entry price. These usually run 0830 until 1700 with a break for lunch. Each car will usually have either three or four runs. These usually run 0830 until 1500 with a break for lunch. Each car will usually have three. PLEASE NOTE THAT DOGS WILL NOT BE ADMITTED TO THE VENUE WHICH INCLUDES THE CAR PARK – Gurston Down is a working farm and prestigious shoot. The Start is crucial to a good time, drivers striving to get just the right amount of wheelspin to get a good “launch”, and then they take the downhill plunge, a unique feature in England, accelerating rapidly up through the gears. A time of 2 secs to the 64 feet mark equates to an acceleration of 1G. They pass through the first “speed trap” at the bottom of the hill, where the fastest cars reach over 130 mph, and then the deceptively difficult Hollow Bend looms rapidly. With a slight brow on the first apex and a radius alters around the bend, Hollow Bend is a high speed challenge all of its own. Next comes the critical approach to the Karousel, which requires late braking on the ideal line to be well placed for the second part of Gurston’s slowest section, a very steep, sharp right hander. This leads immediately to Deer’s Leap, where the most powerful cars can get airborne whilst approaching the braking point for Ashes Bend! The left-hander at Ashes, a critical corner to a good time at Gurston, is a prime viewing point where you can see the drivers trying to prevent their cars running wide on the corner exit whilst attempting to get a good slingshot for the long drag over Burke’s Rise to the Finish, recently renamed Stones. This is the sting in Gurston’s tail, with a deceptive kink over the last few flat-out yards to keep the drivers alert until the end! 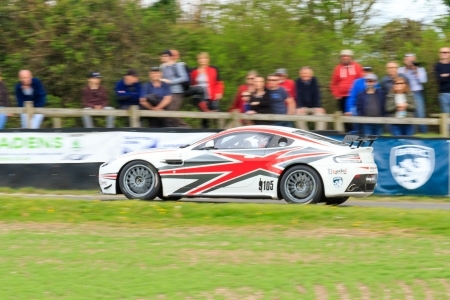 The MSA British Hill Climb Championship, the sport’s most prestigious competition, visits Gurston in May and August. The events in April, June, July and September feature five rounds of our own Gurston Down Championship and the BARC (SW) Top Ten Challenge. The SBD Speed Championship visits in April, the HSA Speed Championship in April and August, the Association of South Western Motor Clubs (ASWMC) holds a round of its Hill Climb Championship in June, and the Association of Central Southern Motor Clubs (ACSMC) Hillclimb Championship visits in April and June. The Autocycle Union’s (ACU) brings the Motorbikes and Combinations to the hill on the Sunday in April, both days for the June and July meetings. These events are held under the rules of the ACU. The “one-day” events commence with two practice runs for every driver in the morning, followed by two “timed-runs” in the afternoon, the fastest of which counts towards class positions. The “two-day” events in May, July and August feature three practice runs on Saturday, and a further one on Sunday morning. Then every driver does one timed run, which counts towards class positions. This is followed by the first British Championship Run-Off, in which the fastest twelve registered competitors from the first class runs take a single extra run each. The fastest ten cars score points, from 10 points for the fastest car down to 1point for the tenth fastest car. Then every driver does a second timed run to settle the class positions, the faster time only counting, after which comes the second Top-12-Run-Off, based on the positions of the fastest twelve contenders in the second class runs. Points are awarded again, as in the first Run-Off. Hillclimb cars come in three categories, split into smaller groups according to the rules of championship at a particular meeting, and then into classes according to engine capacity. The main categories are for production cars, sports racing cars and single-seater racing cars. The programme usually opens with production cars, divided into road-going or modified categories, and split again into ‘series’ (high production volume) and ‘specialist’ (low production volume), classes sub-divided by engine capacity. The sports racing category encompasses the Hillclimb Supersports class and the Sports Libre classes. These sports racing machines are purpose built racing cars with enveloping bodywork, or at least, enclosed wheels, and highly modified engines, aerodynamic wings and so forth, and they can and do challenge for FTD. The single-seater racing cars come in all shapes and sizes, starting with the historic 500cc cars run to the 500 Owners Association rules. The modern equivalents, the 600cc racing cars, are powered by two or four-stroke motorcycle engines, and use a high power to weight ratio to produce remarkable performance. The 1100cc and 1600cc classes are also dominated by bike-engined cars, and there are some highly sophisticated machines competing nowadays.The 2000cc racing car class, until recently still the domain of the automotive-based engine, is increasingly being ‘invaded’ by supercharged and turbocharged bike engined cars of 1300-1400cc capacity, there being an ‘equivalency factor’ of 1.4 applied to pressure charged engines. 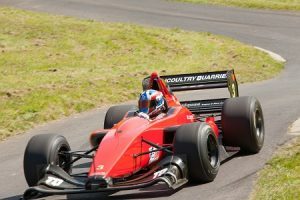 The pinnacle of four-wheeled hillclimb machinery is the unlimited capacity single-seater class. Many of these cars are propelled by ex-Formula 1 and Indycar V8 engines, some enlarged in capacity to generate more power and torque. Huge, soft “slick” tyres develop tremendous grip, and large aerodynamic wings and cleverly shaped bodywork generate aerodynamic downforce to help create even more grip. Every bit helps when you’ve possibly got over 650 horsepower, you’re doing maybe 140mph and the road is only twelve feet wide! And at the Sunday April, both of the June and July meetings, there are also the motorcycles from the National Hill Climb Association. Classes are again split by capacity, and as well as the two-wheel machines, there are the three-wheel trikes and sidecar outfits. 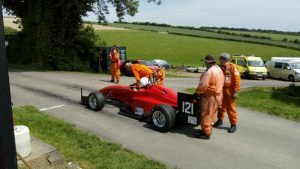 Most of our events also include invitation classes for a wide variety of one-marque clubs from Austin 7s and classic marques to Porsches and Ferraris, so whatever type of machinery interests you, you’ll probably find it at a meeting at Gurston Down! Our visitors can come and see all these superb cars in the Paddock at any time during the day, though if you don’t want to miss the action on the hill, come on down in the lunch break.